Montana has not adopted or made available a definition of college and career readiness. Montana’s state policy allows students to earn dual credit for academic or CTE postsecondary courses taken at their high school or a postsecondary institution. All public postsecondary institutions in the state are required to accept dual-enrollment credits (ECS, 2015). Montana has modified the National Career Clusters Framework and is implementing 11 Career Clusters. 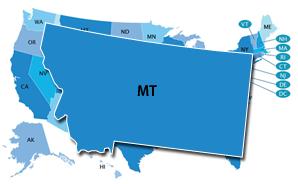 The Montana Achievement Plan (MAP) system is an individualized course planner based on Montana's BSP that provides an easy-to-use tool that helps students prepare for and seek postsecondary educational and training opportunities by giving students a map to guide them through available courses that will prepare them for the next step toward entering the world of work. Montana career plans are not mandated by the state. Montana's BSP is in use but is not mandated by the state. The students included vary across districts. Montana’s state-specific Early Warning System is called the Montana Early Warning System. Early Warning System data are reported at the grade and school levels. It is not publicly available who can access the Early Warning System data.